Protecting quilled jewelry - waterproofing paper jewellery. I had lot of inquiries about ‘how to waterproof paper jewelry?’. There isn’t a simple answer just because each of us has access to different materials, but I’m sure you can find analogues. 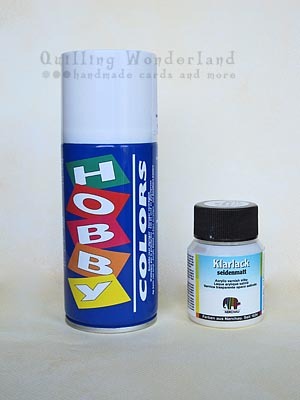 As you can see on the picture above, I’m using only two kinds of varnishes ( I don’t like to complicate my work), both are dedicated to decoupage technique. 1. Varnish in spray: is perfect for the ‘swirl content’ the places you can’t reach with a brush. It will make paper moist and dust resistant but NOT WATERPROOF. 2. Acrylic varnish: this one is my favourite, it makes paper stiff and dries rapidly, you don’t have to wait a few days to finish your work, it’s not yellowing, so you can enjoy all shades of white and the most important part it’s insoluble. You can find it in glossy, matt or silky finish. To apply varnish I’m using 1/8 acrylic brush. It’s pretty small just like my earrings. If this isn’t enough for you here you have more informations about waterproofing paper. Hi, I made some paper quilled jewelry and varnished them with matte finish Modge Podge, but even after drying, the earrings stick to each other and end up getting damaged. Is there any remedy for this? If they were dry it shouldn’t happen. Maybe something is wrong with your Modge Podge. I use fabric glue to protect the quiling earrings. Hello Ramya, thank you for a tip. Never tried it!